Therapeutic riding is the implementation riding for people with disabilities with a view to restoring basic (kinetic, social skills, etc.) of the patient, and improving their overall health and life. The horse in this case is a therapeutic agent. It is applied under certain conditions, with specially trained horses, a specially designed environment, qualified personnel, special equipment, etc. 1. Equestrian Therapeutic Education and gymnastics or therapeutic riding. It is an activity in which our goal is to reap all benefits which are related to movement, to the relationship of the patient with the horse and of the place where the sessions are held. Benefits such as pleasure, entertainment, socializing, improving skills through exercise, etc., or simply learning to ride as a hobby or sport, within a secure framework for all involved. Therapeutic riding must be done by Special Educators, Special education horse trainers, social workers, etc., who have specialized in therapeutic riding, and always under the supervision of rehabilitation professionals, such as physiotherapists, occupational therapists, speech therapists, etc. who are also specialized in therapeutic riding. 2. 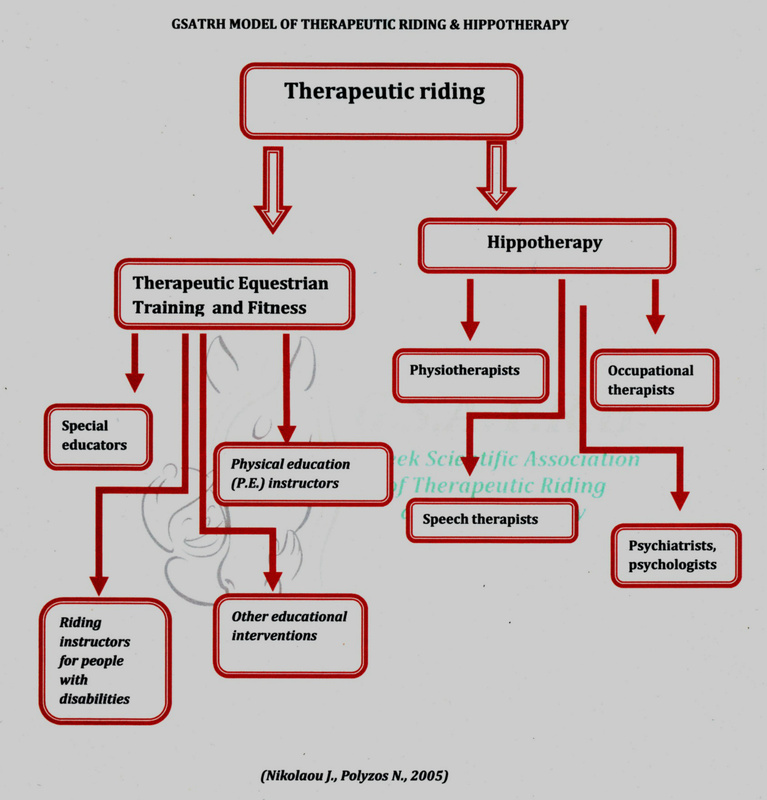 Hippotherapy is a treatment session that include scientists of rehabilitation [physiotherapists, occupational therapists, speech therapists (and under conditions psychiatrists or psychologists)]. This is the transfer of a rehabilitation session from a treatment room in equestrian arena, where as a basic therapeutic agent we use the horse. In that case the only thing that it is different from a conventional session, is the environment (arena) and the main therapeutic agent (horse). Also all requirements (evaluation, treatment protocol, trerapeutic goals, etc.) required in a conventional rehabilitation center, are fulfilled. 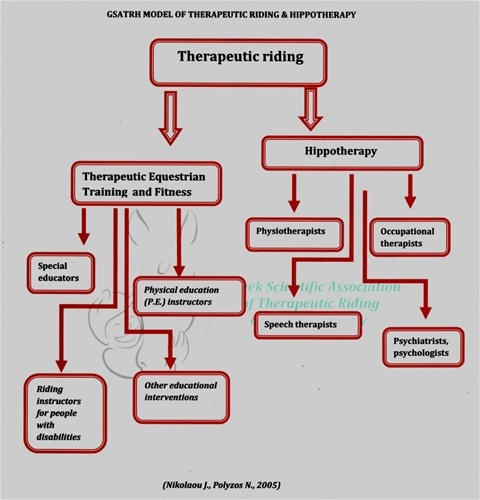 As a Hippotherapy Specialist we can adresse the following therapists: physiotherapists, occupational therapists, speech therapists who are spesialised in hippotherapy techniques.